Like many older folks enjoying the quiet years of retirement, John Wilkinson takes great pleasure in offering food to the birds that arrive near his home in Morecambe, England -- though, perhaps a bit more than most. 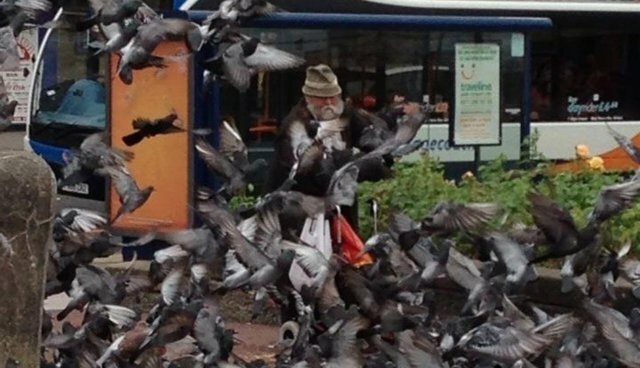 Around town, the elderly pensioner became known as the "Birdman," never hesitating to dole out seeds to any flock of hungry pigeons he ran across. But not everyone was happy to live close by to such a friend to birds. For years, several of Wilkinson's neighbors had pushed the city council to put and end to the Birdman's favorite pastime, complaining that all the pigeons he was attracting were too noisy, messy, and potentially disease-ridden to have around. But it seems that most people never saw much harm in what he was doing. "He is a lovely gentleman, very intelligent and he absolutely loves those birds," says Rita Patton. Wilkinson's bird-feeding ways came to a head in December 2012 when he was issued an Anti-Social Behavior Order, or ASBO, for not heeding to the complaints of his neighbors. Under the terms of the order, he was forbidden to feed birds within 100 meters of his home, and could only do so elsewhere in town within a narrow timeframe each day. The Birdman, however, continued to freely feed birds anyway. But his legal trouble only mounted. In July 2013, Wilkinson was fined for breaching the ASBO, yet he persisted. Finally, last February, he was brought before a court to answer for his supposed "crime." He pleaded guilty and was sentenced, not with another fine, but actual time behind bars. For feeding birds, Wilkinson was ordered to spend 6 weeks in prison. The public's reaction to all of this was outrage. "I just can't believe this has happened and that he's even been given an ASBO in the first place. It's madness," says resident Georgina Thackeray, to The Visitor. "What example is this setting to our kids? Doing this to a man who cares for living things." "It's disgusting the way the justice system has handled this," says Becki Lufc Anderson. Since the oddly severe sentence was handed down, local townsfolk have begun flocking to Wilkinson's defense, demanding that he be freed. A Facebook page devoted to the man some are calling a "living legend of Morecambe" has already garnered more than 500 followers. In a show of solidarity for the jailed Birdman and the feathered animals he lost his freedom offering seeds to, supporters will gather over the weekend to stage a public "bird feed" event.